For the first time, astronomers have discovered alien planets orbiting sun-like stars located in a crowded star cluster, scientists announced today (Sept. 14). The two newfound worlds are Jupiter-like behemoths far too hot to be habitable. But their existence may hearten those searching for life beyond Earth by helping to show that planets can form in a wide range of environments, such as dense clusters, researchers said. "We are detecting more and more planets that can thrive in diverse and extreme environments like these nearby clusters," Mario Perez, NASA astrophysics program scientist in the Origins of Solar Systems Program, said in a statement. "Our galaxy contains more than 1,000 of these open clusters, which potentially can present the physical conditions for harboring many more of these giant planets." Both alien worlds sit extremely close to their stars. Pr0201b completes an orbit every 4.4 days, while Pr0211b makes one lap around its star every 2.1 days. The Beehive Cluster, which sits about 550 light-years from Earth, is an open cluster — a group of stars born from the same cloud of material at roughly the same time (in the Beehive's case, about 600 million years ago). So the 1,000 stars there share a similar chemical composition, researchers said. Astronomers had previously discovered two alien planets around massive stars in clusters, but none had been found around sun-like stars within a cluster until now, researchers said. 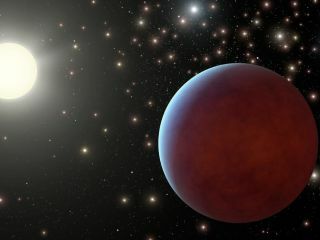 "This has been a big puzzle for planet hunters," said study lead author Sam Quinn, an astronomy graduate student at Georgia State University. "We know that most stars form in clustered environments like the Orion nebula, so unless this dense environment inhibits planet formation, at least some sun-like stars in open clusters should have planets. Now, we finally know they are indeed there." Quinn and his colleagues discovered the planets using a telescope at the Smithsonian Astrophysical Observatory's Fred Lawrence Whipple Observatory near Amado, Ariz. They detected the slight wobble the gravitational pull of the two huge worlds induced in their parent stars. The discovery should catch the eye of astronomers interested in understanding how hot Jupiters end up so close to their host stars, researchers said. Most theories hold that these huge planets form much farther out, then move inward over time. "The relatively young age of the Beehive cluster makes these planets among the youngest known," said Russel White, principal investigator on the NASA Origins of Solar Systems grant that funded the study. "And that's important because it sets a constraint on how quickly giant planets migrate inward — and knowing how quickly they migrate is the first step to figuring out how they migrate." The existence of Pr0201b and Pr0211b should also bolster a prevailing view that stars with higher concentrations of metals — astronomer-speak for elements heavier than hydrogen and helium — are more likely to host planets. Stars in the Beehive are more metal-rich than our own sun, researchers said. "Searches for planets around nearby stars suggest that these metals act like a 'planet fertilizer,' leading to an abundant crop of gas giant planets," White said. "Our results suggest this may be true in clusters as well."